Watson Steel & Iron Works, LLC. Watson Steel & Iron Works is a full service fabrication shop and warehouse headquartered in Charlotte, NC. We fabricate all ornamental products from iron driveway gates, railing, pipe railing, gates, staircases, balconies, window bars, and fencing. Our railing styles include wrought iron, stainless, aluminum, and cable rails. As your steel supplier, you can expect a wide range of quality products. We bring originality to your home or business place. It is our pleasure to delight you with our custom designs, which are all about you. At J&P Metal Arts, Inc. every customer is unique and we dedicate whatever time possible in order to develop your ideas until they become an enjoyable and lasting reality. J&P METAL ARTS, Inc is a father and son owned and operated business. We have been dedicated to serve the community with top-of-the-line products and an impeccable customer attention, adding an extensive experience of more than 20 years in the metal fabrication industry. This is why we are very proud to be here and now, offering you state-of-the-art technology combined with our expertise and knowledge in order to help you make the right choice according to your needs and get the best out of your budget. Besides our residential and commercial customized railings, gates and fences, here at J&P METAL ARTS, Inc, we welcome all types of ornamental steel and aluminum products; as well as, repairs or modifications of any kind, including landscaping equipment, etc, in-house or at the job-site. Shop securely and conveniently at the comfort of your own home, office, or wherever the job may be. We will bring you any samples and designs that you may need to achieve your final custom work. Also, if you prefer, we can easily match any addition or repair that you may require at a lower guaranteed price. 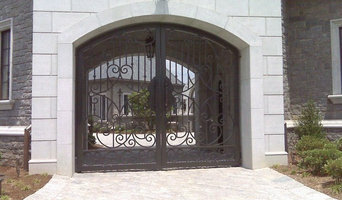 Working with iron, aluminum,design and build furniture,gates, interior and exterior railing systems etc. Walker Welding and Fabrication offers custom fabrication and repair of architectural elements, as well as custom built metal furniture and decorative accents, and repair welding. Specializing in decorative metal support brackets for shelving, mantels, and countertop overhangs. We hand make all of our product in the Blue Ridge Mountains of North Carolina. Located in Mooresville, NC, Mooresville Metal House Inc. provides precision metal fabrication from industrial manufacturing to custom architectural designs and assemblies. We are devoted to giving clients an enjoyable experience while providing excellent craftsmanship in our quality products. One off, artist blacksmith work. Custom hand forged railings, gates, arbors, fireplace accessories, architectural metalwork. Customized mobile lube trailers &amp; trucks from Taylor Pump and Lift assure improved work efficiency. Our lube trailers make job site maintenance simple and more efficient. Prestige Iron Work is a family owed business, started about 12 years ago in Sacramento, California, We been in business for about 7 years in Charlotte,Nc. Our goal is to provide best QUALITY work, we put customers in first place. We are well experienced and professional and always on time, we have certified welder with over 35 years of experience, with welding certificate. We do Commercial and residential work, we are experts in various forms of iron work. We have extensive experience crafting iron and aluminum railings, gates, window guards, fences, decorative stair cases,spiral staircases and I-beams. quality and customer satisfaction are our main goals. I know quality is important to you, as it is in our family-run business. We are a metal fabrication shop specializing in custom iron work. Our goal is to provide the best QUALITY work. We are dedicated to the production of high quality custom metal fabrication. We put customers first. We are well experienced and professional. We also have extensive experience in crafting iron, aluminum, and stainless steel. Quality and customer satisfaction is what we strive to achieve. We know that people love quality and we understand that our clients deserve that quality and we achieve that quality. General fabrication shop specializing in cnc plasma work in metal and wood . From custom signage to furniture to repair . We have you covered . We specialize in commercial repairs and installations, custom residential projects and any work with specialty metals. Not sure what you need? Give us a call and let us help you! See www.hurdcontracting.com, call us at 704-616-4427, or check us out on Facebook. We sell standard balconies and railings online. 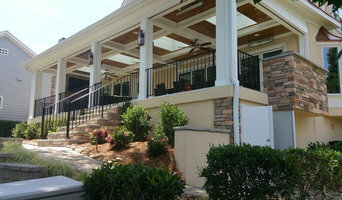 We also do custom designed balconies and railings. We manufacture metal stairs, bollards, metal louvers, and miscellaneous steel. An ornamental ironworker fabricates bulk iron into the types of structures that a particular home calls for, then installs them onsite. Some of these pieces are mass produced, others custom crafted. Many ornamental ironworkers also have the design skills to fashion unique decorative components. Ironworkers must be trained in safety to create elements such as railings and balconies that both satisfy a home’s aesthetic needs and meet Denver, NC building codes. Here are some related professionals and vendors to complement the work of ironwork: Fencing & Gate Sales & Construction, Decks, Patios & Outdoor Enclosures, Siding & Exteriors. Find an ironworker on Houzz. Narrow your search in the Professionals section of the website to Denver, NC ironwork. You can also look through Denver, NC photos to find examples of ironwork that you like, then contact the ironworker who fabricated them.